‘Evict the managers’. The message, held high on a banner leading the student protest of the 11th of April, exactly one year after the Maagdenhuis occupiers were forcefully evicted by the police, was loud and clear. 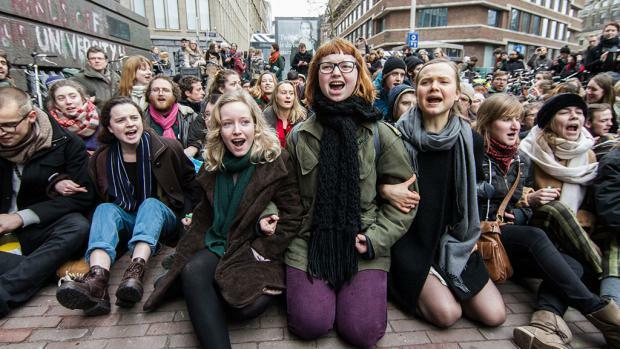 The protesters marched from the Roeterseiland Campus to het Spui, the square in the centre of Amsterdam where the administrative headquarters of the University of Amsterdam and the Amsterdam School of Social Sciences are based. In the fifty years that the Maagdenhuis has served as the administrative headquarters of the UvA, it has seen a good many occupations. Some have even gone into the history books as key moments in Dutch history – the most notable being the 1969 Maagdenhuis occupation – leading the former president of the UvA board Louise Gunning to concede that, ‘Occupations are a part of UvA-culture’ (after which she ominously added: ‘and so are evictions’). But what are the reasons for such student discontent in the past years? Louise Gunning has always upheld that the UvA has the best intentions of its students in mind when formulating its policies. ‘We want students to be well-prepared for the labor market,’ Gunning stated in a recent interview with Folia. And: ‘We take international competition seriously.’ And with effect. The UvA is among the best universities in the world. The Times Higher Education Ranking puts it at 58th place; the QS World University Ranking ranks it 55th. But numbers aren’t enough. It is a lack of consideration for the university as a place of academic freedom, creativity and community that has led to the protests and occupations. ‘It started with the bètamerger,’ Jaap Oosterwijk, one of the key figures in the student protests over the past two years explained to a Folia reporter during the Maagdenhuis occupation. In 2013 the UvA wanted to merge its Faculty of Science with the science faculties of the Vrije Universiteit, the other Amsterdam-based university, and the representative bodies of the UvA had to decide whether or not they would give their consent. While they agreed that the merger could be financially beneficial, they had serious concerns about its impact on the quality of education. The universities, however, did not wait for the mandatory approval of the representative councils, but hired Karen Maex, a Flemish academic hotshot, who was announced to take office as the dean of the science faculties of both universities in October 2013. The initial backlash was limited to posters (‘The board does not take the opinion of its students into account’) being plastered across the facades of the science faculties, but the situation quickly escalated. Protesters believed that Maex’s appointment marked a point of no return. Decisions that directly impacted students had been made without consulting them. This could happen again. Eventually, the representative councils formally disapproved of the merger, and Maex took office of three separate science faculties instead. To Oosterwijk, there was only one conclusion to be drawn: ‘The board does not take student voices into account; it does not take student representation seriously enough’. After the Faculty of Behavioural Sciences moved from the Spinhuis to Roeterseiland, students promptly squatted the place. At the new Roeterseiland campus, students were not allowed to organise their own common rooms, the reasoning (of the UvA) being that this would cause unfair competition to the company catering the campus canteen. 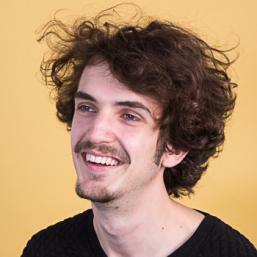 ‘Over the years, the university has become less of a place of self-development and more a company that aims for efficiency and profits,’ philosophy student Yvo Greijdanus wrote in a piece for Folia at the time. The students squatted the Spinhuis for weeks: they organised lectures, started a pop-up café and organised drinks for the student associations of the sociology and anthropology faculties. The UvA’s prioritisation of efficiency and economic viability over academic quality quickly became known as ‘rendementsdenken’ or, ‘the doctrine of return’. It was seen as the cause of the deterioration of academic quality and as a limit to personal development. The UvA’s doctrine of return caused much unrest among the student population, and when the university announced that small language studies such as Czech and Hebrew would disappear due to the low number of students enrolled, the floodgates opened. Students turned to the streets in protest and eventually occupied the Bungehuis (the seat of the humanities faculty) for eleven days. On the 23rd of February, the occupiers negotiated with the board of the UvA for three hours but to no avail. The day after, the Bungehuis was evicted. Forty-six occupiers were arrested and a procession of sympathising students marched from the Bungehuis to het Spui. This is where the Maagdenhuis is located. ‘We don’t know who kicked-in the doors, but eventually the doors opened,’ philosophy student Jarmo Berkhout recounts. When the protesters that left the Bungehuis reached Spui Square, many students and professors had joined them. The doors of the Maagdenhuis were forced open and kept open for almost eight weeks before the students occupying it were forcefully evicted by the police. At the protest’s peak, over a thousand people were present. In those forty days, students and professors turned the central hall of the Maagdenhuis into a common room where they organised lectures, concerts and debates. The protest quickly gained momentum, however, and soon the doctrine of return was only one point on a list of the protestor’s concerns, which also included job insecurity of professors caused by short-term – and highly flexible – contracts, as well as a lack of democratic mechanisms within the UvA’s administration. On the night of the 7th of April, negotiations between the university board and the occupiers came to a seemingly constructive conclusion and the negotiating occupiers agreed that the building would be vacated by 9pm on Sunday the 12th of April. 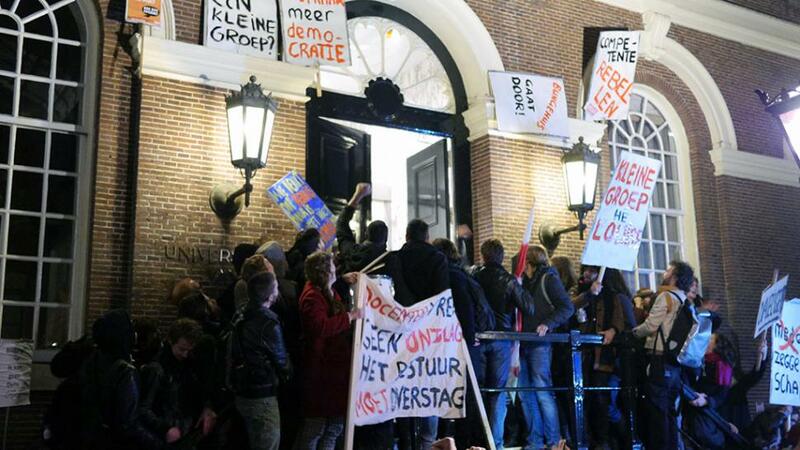 However, when they returned to the Maagdenhuis with the terms, a large majority of the protesters disagreed. Some of the occupiers pledged to continue their protests but that they would do so through channels other than occupation. Some stated that they would leave the Maagdenhuis but would only do so on Monday the 13th of April, after the festival that was organised there had finished. Others outright refused to leave until the board of the UvA resigned. The division caused confusion within the UvA administration about whether the protesters would live up to their part of the deal and the university board – impatient and not willing to take any risks – asked a judge to rule for eviction. On Saturday the 11th of April the police forcefully evicted the occupiers. Nine students were arrested. The hectic nature of the evictions and the involvement of a judge stirred a controversy. The representative bodies of the UvA, whose refusal to accept the bètamerger served as the catalyst of a two-year period of unrest that has still not come to an end, eventually demanded the resignation of president of the board Louise Gunning – and they got what they wished for. It has not been plain sailing since either. Students and professors have been calling for more representation in the member-selection process of boards and committees for months, and the appointment of a new president and rector magnificus has been postponed. Last month, the names of two potential members of the university board, Karen Maex and Geert ten Dam, were leaked, and calls for democratic input in selection processes have, consequentially, gotten louder. Around the same time, Hans Amman, the only remaining board member, decided to step down as a result of a protest against the increasing unification of the HvA and the UvA administrative bodies. It is safe to say that discussions about democratisation, the doctrine of return and the quality of education will not end any time soon, and that the protest last week will not be the last. Occupations and evictions may be part of the UvA culture, but to these protesters democratisation could, and should, be too.